Refurbished by a community group of volunteers in February 2008. Following the refurbishment, the hut now boasts an extension containing a new kitchen, separated by a door from the main 6 bunk room. The result is a well insulated, warm bunk room, with a ventilated, light kitchen area. The best of all worlds. A great design of hut. Other novelties include solar lighting. Park Forks routes • By TararuaHunter. Licence: C.
Main access is from Tarn Hut down Dorset ridge, which takes an hour or so. 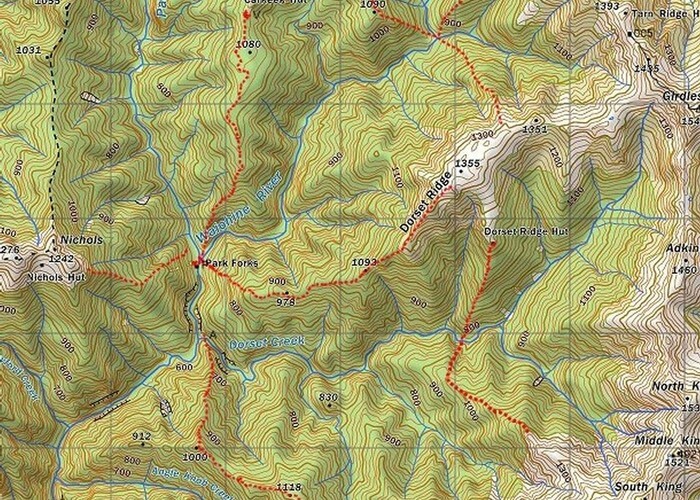 A route leads directly to Dorset Creek below the hut. An old route leads up the spur opposite on to Cairn, a low knob south of South King. River travel also allows access to spurs up to McGregor Biv or The Kings. in low to moderate river levels. An unmaintained track leads down Dorset Ridge to Park Forks, with access on to Nichols, Carkeek and McGregor Huts / Bivs, if the rivers are crossable. Added 15 March 2008 by MatthewMatthew. 2 revisions, most recently 26 July 2014 by TararuaHunterTararuaHunter. 232 views in the past year (19 per month).